I’m seeing glimpses of fall all around us. Red and orange leaves on our neighbors tree. Cool mornings. Acorn bits all over our yard. Fatter squirrels. And pumpkins and mums on the grocery store front patio. And I’m having visions of butternut squash on our table in the next few months! We all LOVE butternut squash…and this is my favorite way to prepare it. Topped with a little brown sugar. And perhaps butter if you like, but I don’t think butter is necessary! Cut off the stem on top and then slice in half lengthwise. Place in 9×13-inch glass baking dish with 1/4 inch of water. 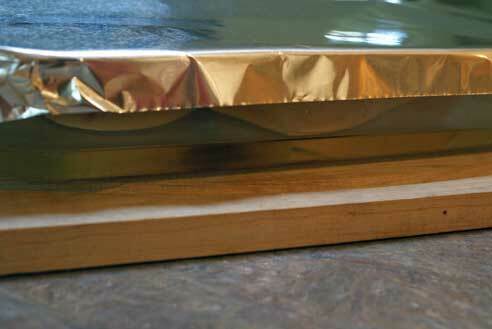 Cover tightly with foil and bake at 350 for 50-60 minutes. Remove from oven and let cool a few minutes. Scoop out seeds and discard. Scoop out flesh into serving bowl. Serve as is. Or add some brown sugar. And perhaps some butter too. And this makes a great baby food…as is for an older baby, or pureed with a bit of water for younger baby! HOW TO SELECT the perfect butternut squash…look for a squash with no marks on its skin, no soft spots, and it should feel “heavier than it looks.” They range in size, so choose one that will work for your family. Any extra squash can be used in homemade macaroni and cheese or for baking! How do you select them and what do they taste like? Tastes like squash…I don’t know how else to describe the taste! A bit of brown sugar helps the taste too. You want the squash to feel heavy, to have no soft spots or marks on the skin. I’ve been looking for a recipe to do this! I need one confirmation though, the squash goes face up in the baking dish, right? I put it face down. I can’t wait for squash! I bake it this way too. My son loved this when I made baby food. Also, some cinnamon is good with this as well. 🙂 Thanks Erin! does it taste simular to yellow crookneck summer squash? Not really. It has an entirely different texture…and taste too. All I can say is just give it a try!!! I planted three hills of squash in my garden this year. I’ve given away literally dozens, and I still have dozens of them left. You can do anything with squash that you do with pumpkin; my husband thinks butternut squash pie is better than pumpkin pie. I found the recipe for butternut squash soup on the Internet, and that’s a hit around here also. I remove the seeds of the squash that will fit in my microwave, and they cook fast that way. @Donna W, You also can cut it into chunks and freeze…or you can puree and mix into any kind of pasta. I put it with mac and cheese or even baked chili mac (had to use my leftover chili) for a nutrition boost. No one knows the difference! You can also mixed with mashed potatoes for lower calories…very tasty and good for you too. I love acorn squash. Love the smell of it cooking in the oven. A touch of brown sugar (Splenda brown sugar sub works just as well) and butter is a must! The butter really adds flavor. Mmm. I can’t wait. splenda and butter? why bother with the splenda if you’re having butter anyway? Why do you care how she eats her squash, Miss Goody Two Shoes??? Are you the new food police??? This is a much more efficient method of cooking butternut squash — or any hardshelled squash. Attempting to peel a squash is madness. Ungainly, awkward, and dangerous. Good for you to get the word out. Mmmmmm – I love butternut squash! I’ve made it the same way, but I also like to peel it and dice it up to roast in the oven. Earlier this year I made a butternut ravioli with sage cream sauce that was delicious! If you have a nesco you could cook a lot of butternuts at once,Clean out of skin, mash and put in freezer bags, freeze and enjoy all year round. 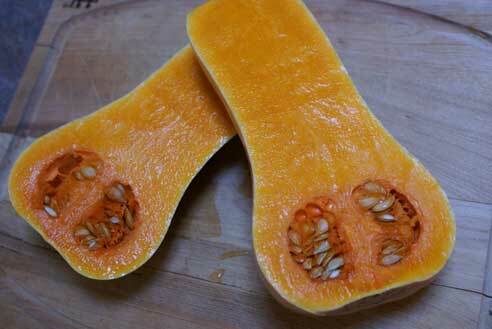 Any chance you have a yummy, healthy and semi frugal butternut squash recipe? I love acorn & butternut!!!!! I slice them in half, scoop out all the seeds and rinse them. Then I will do one of 2 things. 1. stab the inside with a forks a few time and then add a dab of butter. Then add salt, pepper & garlic & herb seasoning to taste. Then bake them in a pan covered with foil for 30 or so mins depending on size until soft at about 350 degrees. 2. cut in half clean then out and stuff then with a chicken rice stuffing I make out of rice-a-roni and sausage and bake until soft about 30 to 40 mins, yummy! Oh I also cut it up and bake it in a garlic & herb mixture, yummy also!!! I do not like the sugar in my healthy squash!!!! Ok, now I would like some of these recipes! The chicken rice stuffing, the butternut ravioli and sage sauce; the butternut pie; Any and all welcome! My question is what is the best way to freeze them? I normally stab mine a few times and just throw the whole thing into the oven for 30-45 minutes. It softens up and makes it much easier to cut in half. If it still needs some bake time I will put it in a dish (I use stoneware) with water and finish it off. I, too, like mine with just brown sugar — YUMMY!!! The best part about squash is that right now it’s 69 cents/pound at my Kroger in Indiana. Wait a bit longer and it’ll be cheaper than that. You can get a lot of yummy goodness from 1 squash and very little $$. I cook butternut squash in the pressure cooker when time is short; it takes about 15 minutes start to finish. On days when the sun is shining, I cook it in my solar oven; not sure about the minimum time. I leave it out there for about 6 hours. It’s very good this way. One more thing, the butternut squash that I grow in the garden will store in a cool closet all winter. Yours should too if the squash is bought fresh. I agree with Patti D! Please link to some of these recipes! We’re getting tired of the same old & my boy friend just had a tooth removed so squash would be absolutely perfect! Does anyone know if cubed and roasted squash holds up in the freezer? 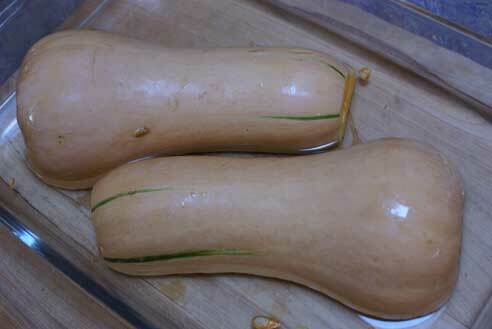 I like to roast cubed squash w/ onion, olive oil , salt and pepper and then serve it with pasta. I was wondering what the texture was like if you froze it. Thanks Erin for posting this! I had butternut squash spring up in an old compost pile this year and produced 7 beautiful squash. I used a store bought one last year to make a butternut squash casserole (as a replacement for sweet potato- which is what I think it tastes like but a more creamy texture!) at the Thanksgiving Day dinner table… Well those seeds took root and I had a wonderful surprise in the garden this past spring! I didn’t want to go through the fuss of peeling dicing and mashing like last time. We will be noshing on a baked one like this for dinner tomorrow! Thanks again! Butternut is one of the most nutritious and prolific producers (next to zucchini) in the garden. The seeds are especially nutritious (seed the nutrition data link) and are, unfortunately, discarded by most overly fed Americans. Try them raw, dried or roasted for a great, healty snack. I used to risk my fingers by cutting these hard squash before cooking. In search of an easier way, I tried cooking one of the couple dozen I got from the garden in the microwave. I washed it and microwaved it whole in a dish for 15-20 minutes on high. After letting it cool a bit I cut it in half and noticed the skin peeled right off, the seeds scooped out with ease and the flesh tasted just as flavorfull and sweet as usual. This same technique works great for spaghetti squash, baked or sweet potatoes, etc. So much for the need to get fancy with cooking. Just apply heat! Remember – eat the seeds too! R Greene (or anyone else who can answer my question), I have wanted to do this, but was concerned I couldn’t roast the seeds if I already cooked them. Can the seeds still be roasted after the squash is cooked this way? Thanks! I had never purchased butternut squash since I did not know how to cook it in a healthy way. My husband I tried your recipe tonight and LOVED it! 5point yum factor from us both. We did add a little butter but was just as good without. I found out about your cookbooks by looking on the internet on how to cook butternut squash. I would like to know how much your cookbooks are and what kinds of books do you offer, and how much are they. I collect cookbooks. fore. Thanks for the tips. Thanks for all the cooking tips. I’m going for the simple top cut off, slice long, face down on a baking sheet, 350F 50 min., turn over, stab w/ fork, slather w/ butter and syrup, return to oven face up for 10 min. “Eat, life is to enjoy, so eat.” That was the best I could come up w/, but it is all based on this publics wonderful ideas. Sounds great. I’m going to try it this way tonight. Love butternut squash in many ways! Just this week I baked some and made a Butternut Thai Curry Soup and I pureed some to make some Butternut Squash Sandwich Bread- so good!